Well, this thing not only happens with the Android Users. Apple users who usually update their iOS powered devices also get stuck during the booting or recovery process. There are even cases when the iPhone users found their device stuck at the logo mode, and couldn’t get it fixed without a trip to the customer service center. These things usually happen when you try to jailbreak your device, access the recovery mode, etc. Fortunately, just like Android Ecosystem is always backed by the Open Source developers who’ve deployed numerous ways and programs to repair your device. Similarly, many software development companies have also introduced their utility tools to help the Apple Fanboys with such stuff. Tenorshare is another well-renowned name in the software utility business. The Tenorshare ReiBoot is a free software that helps you in recovering your iOS device from the recovery mode or the other way around. Moreover, it also helps you to recover from other worst scenarios like Bootloop, and other iOS stuck issues. So, without any further chitter-chatter, let’s start the review of Tenorshare ReiBoot Software. Tenorshare offers the Reiboot tool in both free and premium versions. The free one is however limited to some features only, and you need to license it for the exclusive professional tools. You can download the free version of Reiboot directly from the official Tenorshare website. The Pro version costs you around $29.95. It helps you to resolve the overheating, and sudden crashing issues easily. The freeware version only solves a limited number of errors and bugs, and only works in recovery mode. However, the premium version helps you to restore your iPhone, iPad, iPod, etc. from tons of different stuck issues. It also resolves the iTunes error for most of the devices with large compatibility support. 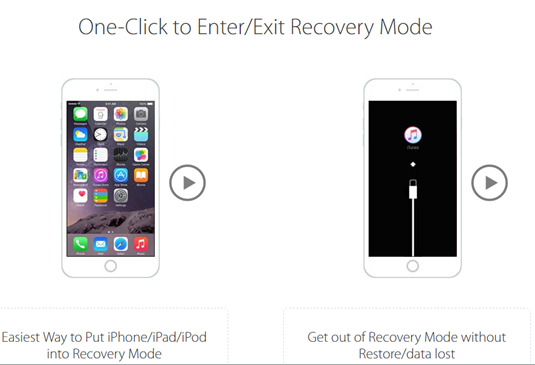 Exit Recovery Mode: - You can easily recover your iOS stuck device from the recovery mode. The tool does the job, and you won’t have to face any data loss, and you won’t need to restore anything afterward. Moreover, you can carry out the process in a reverse manner. Solve other iOS stuck issues: - Repair other issues like device hanged on connecting to iTunes screen, boot loop stuck, Apple logo stuck or simply fix iPhone stuck after jailbreak. This review or a guide on how to recover your iOS device is going to help all those tech savvy guys who accidently screwed up their phones during the Jailbreak process. To get started with the review, let me shed a little light on the recovery processor mode in iPhone/iPad and how much useful it is. Recovery Mode helps you to restore your iOS powered device from the stuck or unresponsive screen. It mostly happens due to the unstable upgrade or downgrade of the iOS update. Also, your iPhone/iPad can get slow, unexpectedly crash or get stuck in between the app processes, and tools like ReiBoot are the helpers in your day of misery. To start with the recovery process, download the Tenorshare ReiBoot from its official website. As it is a freeware, therefore it is available free for both Windows and Mac. The installation is a short process, and within a minute, you’ll be all set to rock and roll. Then, simply connect your iPhone/iPad to the laptop via the USB cable. The UI is simple, and you’ll see three basic options, click on the Exit Recovery Mode. The program will restart your iOS device and would try to boot using its smart algorithm. Just wait for the Reiboot to perform its magic. Follow these simple steps, and your stuck iPhone would be easily out of the recovery mode. However, if the following guide didn’t help you to recover your device, then the Fix All iOS stuck issues should be your option for the consideration. These features are extensively available in the pro version only. You can upgrade as per your requirement. Easily put iPhone in recovery mode and carry out simple booting process. Recover Your stuck iPhone/iPad from the DFU mode. Restore the stuck at Apple logo issue, and black screen stuck or stuck on Connect to iTunes. Reiboot is available to download and use without any cost. Very simple and minimal UI to use and restore the device. One-Click solution to restore all the iOS bricked devices, mostly the iPhones. The process of getting out from the recovery mode is a little time taking but considering the options of restoring your iPhone or iPad without any data loss can always balance out the situation. So, this was my take on the Tenorshare’s Reiboot recovery software and to conclude, ReiBoot is a great utility software with the capabilities to resolve different stuck issues on your iOS device. Do share your thoughts and let me know if you’ve used Reiboot to successfully recover your iOS device from Bootloop or recovery stuck in the comment section below. Cheers!